Pan American World Airways was one of several carriers that was created and flourished as a result of the Air Mail Act of 1925 (Kelly Act). The Air Mail Act of 1925 was the first major piece of legislation created by Congress in 1925 that would effect the aviation industry. The Act authorized the awarding of government mail contracts to private carries, and established rates for transporting mail. This Act inspired owners of aircraft and investors to start up air carrier services, providing airmail service as it was very profitable. Pan American World Airways, was one of several air carriers that grew out of the Kelly Act. Pan American Airways had procured a lucrative airmail contract from the United States Postal Service in 1927. The contract was to deliver mail to and from the Country of Cuba and United States. It was the Key West, Florida Havana Mail Route The airmail service to Cuba, had proved to be a very profitable route for Pan Am. Its owner, Juan Terry Tripple had such success he expand services between the United States, Mexico and Latin America by 1930. Although Pa Am was providing some passenger service, it was not the bulk of it business. During this period of time, air carriers in general did not concentrated its energies on passenger service. As airmail contracts were much more profitable per air-mile and aircraft were limited in gross weight, roughly around 3,500 pounds. It was much more cost-effective to for air carriers to provide air service for cargo than passengers. However, with the establishment Airmail Act of 1930, air carriers were forced to contend with passenger carriage. The Airmail Act of 1930, changed how airmail contract were to be awarded to air carriers. The act in essence forced air carriers to purchasing larger aircraft. In turn, it placed the carrier in a position of being able to bid on postal contracts, increasing the likelihood of being awarded airmail contracts. To remain competitive air carriers now had to fill space on the aircraft with passengers. This act as well created a frenzy within the industry. For the first time in history, air carriers were being swallowed up by more solvent carriers. This in an effort to increase aircraft inventory and to acquirer air routes that these air carriers had already received rights. By the mid 1930, Pan Am had taken over several smaller air carriers. This in an effort to strengthen its markets and to gain access into new air passenger and airmail markets. On May 20, 1939, Pan Am launched the first U.S. passenger service to Europe, using the Boeing 314 Yankee Clipper, the "flying boat". With the explosion of the Zeppelin Hindenburg in 1937, the flying boat replaced the need for such airships as the Hindenburg. However, the flying boat soon became obsolete. With the United States entering into World War II, Pan Am began providing military transport of US troops into Europe, Africa and Asia. This gave Pan Am the insight and edge over other carriers into that part of the world. By the end of the war, Pa Am had establish passenger and cargo routes throughout the continents of Africa, Europe and Asia. By the mid 1970's, Pan Am had changed its name to Pan American World Airways, acquired several air carriers; such as American Overseas Airlines and National Airlines. Had increased its passenger and cargo services to include such routes as New York to London and had become one of the world's largest air carriers providing passenger and air cargo service. By this time Pa Am's aircraft fleet had included the Boeing 727, 737, Douglas DC-10, Airbus A-300 and A310, and Lockheed L-1011. By the mid 1980's, US air carrier profits and ability to remain competitive began to weaken. This brought on by airline deregulation, worldwide recession, airline airfare wars and higher fuel costs. Pan Am was being to loose ground. Of the US airline giants, Delta Airlines, United and American Airlines appeared to maintain their leading positions. Delta Airlines achieved major carrier status after deregulation. Pan Am's competitive edge in foreign markets further placed Pa Am in harder times over other air carriers, due to the turmoil in world politics. Pan Am aircraft were now being used as a conduit by third world countries in an effort to change world politics. An example of this was the bombing of Pan Am's flight 103 over Lockerbie, Scotland in 1988. In which 258 passenger were killed. It was believed that Iran was involved. In London, an anonymous caller phoned the Associated Press to claim that Pan Am flight 103 had been attacked in retaliation of a US Navy F-14 shooting down an Iranian Airbus in July in which 290 passengers were killed. 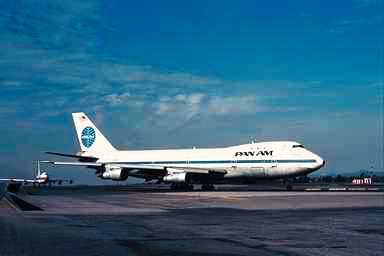 The downing of flight 103, and the trend for terrorist to attack US air carriers significantly hurt Pan Am.